I made a very quick card for Hope You Can Cling To today. This one was for Libby's challenge and here's her description: When your family is faced with this disease, you just want to shower them in hugs and kisses . So how about we do some stampy kissing? I'd like you to make a card using the KISSING TECHNIQUE. I used my pink ribbon stamp and kissed it with the flourish from an old Sale-a-bration set, Bliss. 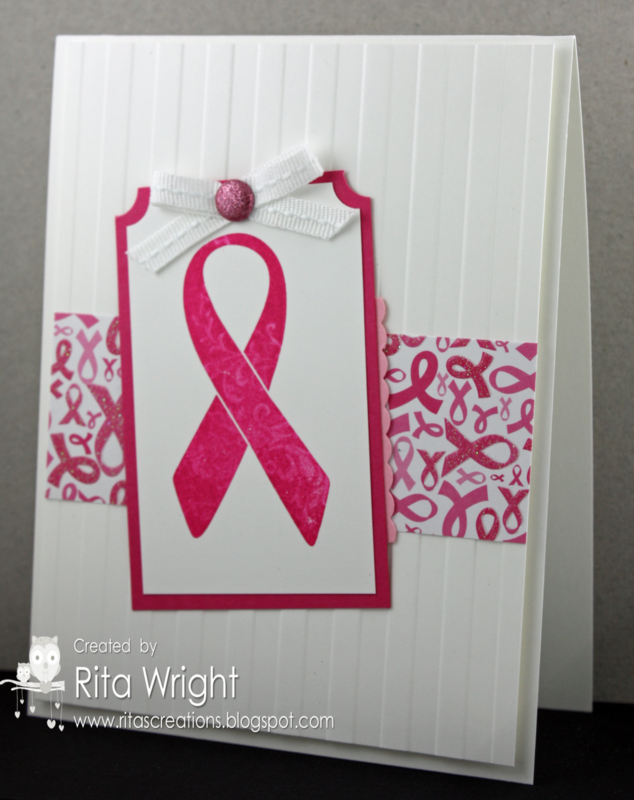 I thought it added a cool pattern to it that worked well with the ribbons paper. I kept the rest simple, just adding some ribbon and a glimmer brad. The sketch for this was a previous one from Retro Sketches. Great card Rita! Love that pink! Laila is so cute in her little outfit but where are the pics of her in her Halloween costume?! Some of us who don't have cute little girls depend on those of you who do to post these adorable pictures for us!!!! I was in a Hobby Lobby for the first time ever a few weeks ago...it's a beautiful place! Keep Calm and Mash It Up!